The EU’s trading scheme isn’t a surprise, it’s just that airline companies and nations have been slow to address the issues surrounding Brussels setting global aviation policy. A coalition of industry lobby groups urged the Obama administration on Monday to take more aggressive measures to challenge an EU law that forces airlines that use European airports to pay for their carbon emissions, as two U.S. agencies prepare to host 16 countries to discuss a global framework for an alternative. Groups including Airlines for America (A4A) and the U.S. Chamber of Commerce sent a letter to Secretary of State Hillary Clinton and Transportation Secretary Ray LaHood calling on them to file an action under the U.N.’s aviation body, the International Civil Aviation Organization (ICAO), to force the EU to stand down from forcing foreign airlines to comply with the bloc’s emissions trading system. EU countries are among ICAO’s 190 members. “As each day goes by without an EU act to halt or suspend the ETS, the harm to U.S. airlines and aircraft operators and the threat to U.S. sovereignty grow while the U.S. government’s credibility is weakened,” the groups said. 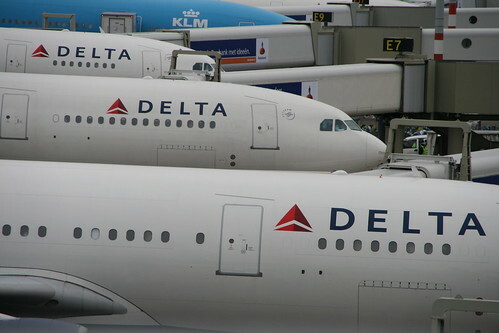 Delta planes at their gates at Amsterdam’s airport. Photo by Pete. The coalition sent the letter the day before the departments of State and Transportation host a two-day meeting on July 31 and August 1 in Washington led by the State Department’s climate change envoy Todd Stern, who represents the U.S. in U.N. climate treaty negotiations. The meeting will “explore whether there might be a basis for a global solution to addressing greenhouse gas emissions from aviation and a global solution that would include the EU,” a senior administration official said Monday. The official said the meeting will not conclude with a draft declaration, but would explore whether opposing countries and the EU could agree on goals and a market-based framework to curb carbon emissions under ICAO. A large portion of the meeting will likely be spent on a carbon-neutral growth goal from 2020 that ICAO members agreed at their last assembly in 2010, and other “building blocks” for an ICAO agreement, such as market-based measures, according to a document seen by Reuters. The senior administration official said, however, that countries are “far from any agreement” on whether to adopt a global carbon offsetting measure or a kind of carbon trading market. The EU has been firm in its insistence that countries comply with its emissions trading system, but has said it would be willing to take part in an ICAO solution if the framework agreed is non-discriminatory, mandatory in every country and more environmentally stringent than the EU’s system. Hedegaard and other EU officials have complained in the past that ICAO has had more than a decade to come up with a greenhouse gas plan and were doubtful that it could forge a global solution in just a few months. Brian Havel, director of the International Aviation Law Institute in Chicago, said despite EU doubts about the intentions of the United States and other opposing countries, the fact that they are holding the meeting now suggests they are serious. “I don’t expect any major breakthroughs this week, but the very fact that the meeting is happening suggests some of the non-EU States, notably the U.S., legitimately want to see a global agreement that breaks the current impasse,” Havel said. With airlines facing their first EU deadline to pay for their emissions in April 2013, they are motivated to work through their differences now “to avoid a potential trade war next spring,” he said.